If you have been waiting to buy Reliance Jio’s feature phone JioPhone, here are available several online shopping center are selling the 4G feature phone on Amazon or Ebay website. The minimum price at which the JioPhone is available on the e-marketplace is rupees 1,700 from a seller. The price of the JioPhone varies from seller to seller and so does the delivery charge and estimated time for delivery. The online shopping centers are offering one-year warranty in JioPhone, valid at all Jio Stores across the country. Dual Camera With Back Flash. Single Nano SIM With Expandable Memory Card Up To 128GB. Jio TV App, Jio Cinema App, Jio Songs Listen Online And Many More. You Can Pay Payment Online With Jio Money App. 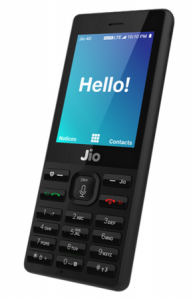 The JioPhone was launched in July 2017 at rupees 1,500 and the amount is refundable after three years, the price rate is available only on Jio.com official website. The JioPhone has a 2.4-inch QVGA display and it has 1.2GHz dual-core SPRD 9820A/QC8905 processor coupled with Mali-400 and 512MB RAM. It runs on KAI OS and has single-SIM (Nano SIM) functionality.